If you’ve heard the catchphrase “Shop Small” once, you’ve heard it a million times. But what does it really mean to shop small? To me, shopping small means supporting the small guys. You know, the ones who are living their dream. The ones who took a risk and decided to do their own thing. Even though they’re called “small”, small businesses are anything but. What these businesses accomplish is actually quite big. They create jobs; according to the SBA, small businesses create about 2 out of 3 new jobs in the U.S. each year. They generate local tax revenue; by choosing a small business over a big box, more of your tax dollars are staying local and supporting necessary services like schools and first responders. They innovate new ideas; according to Inc.com, they produce 16 times more patents per employee than large companies. They offer a personal touch; small businesses have more unique offerings and a personal customer service experience that big box stores can’t compete with. By choosing to spend your dollars with the small guys, you’re not only contributing to, but also benefiting from all these things. 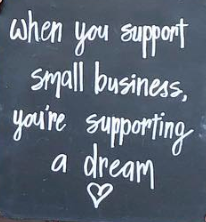 If you love your local small businesses, shopping with them is the best way to show it. Grab a cup of joe at your neighborhood coffee shop, eat at a local joint and grab a gift from a small retailer. I promise you, it makes a difference and you can feel good knowing you’re supporting someone’s dream.